Igneous rocks form when molten rock (magma) originating from deep within the Earth solidifies. The chemical composition of the magma and its cooling rate determine the final rock type. Intrusive igneous rocks are formed from magma that cools and solidifies deep beneath the Earth's surface. The insulating effect of the surrounding rock allows the magma to solidify very slowly. Slow cooling means the individual mineral grains have a long time to grow, so they grow to a relatively large size. Intrusive rocks have a characteristically coarse grain size. Extrusive igneous rocks are formed from magma that cools and solidifies at or near the Earth's surface. Exposure to the relatively cool temperature of the atmosphere or water makes the erupted magma solidify very quickly. Rapid cooling means the individual mineral grains have only a short time to grow, so their final size is very tiny, or fine-grained Sometimes the magma is quenched so rapidly that individual minerals have no time to grow. This is how volcanic glass forms. 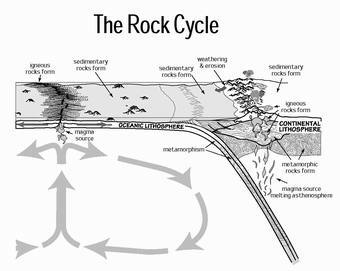 Sedimentary rocks are formed from pre-existing rocks or pieces of once-living organisms. They form from deposits that accumulate on the Earth's surface. Clastic sedimentary rocks are made up of pieces (clasts) of pre-existing rocks. Pieces of rock are loosened by weathering, then transported to some basin or depression where sediment is trapped. If the sediment is buried deeply, it becomes compacted and cemented, forming sedimentary rock. Clastic sedimentary rocks may have particles ranging in size from microscopic clay to huge boulders. Their names are based on their grain size. Chemical sedimentary rocks are formed by chemical precipitation. This process begins when water traveling through rock dissolves some of the minerals, carrying them away from their source. Eventually these minerals are redeposited when the water evaporates away or when the water becomes over- saturated. Biologic sedimentary rocks form from once-living organisms. They may form from accumulated carbonrich plant material or from deposits of animal shells. Foliation forms when pressure squeezes the flat or elongate minerals within a rock so they become aligned. These rocks develop a platy or sheet-like structure that reflects the direction that pressure was applied. Non-foliated metamorphic rocks do not have a platy or sheet-like structure. There are several ways that nonfoliated rocks can be produced. Some rocks, such as limestone are made of minerals that are not flat or elongate. No matter how much pressure you apply, the grains will not align! Another type of metamorphism, contact metamorphism, occurs when hot igneous rock intrudes into some pre-existing rock. The pre-existing rock is essentially baked by the heat, changing the mineral structure of the rock without addition of pressure.